Coming into The City on the cushy Dartmouth bus, on a summer Saturday morning, we passed through the Bronx, which was my home until I was six years old. I was surprised at how the flat-fronted yellow brick buildings and the chain-link fences brought back distinct memories of my family’s life on Sherman Avenue: the smell of the cigars smoked by the Italian man with the big moustache at the fabric store; the creak of Mom’s foldable grocery cart as we trundled along the sand-colored sidewalks back home from the A&P; the flicker of tenements burning on those nights in the mid-’70s. My parents had come to New York from rural Pennsylvania as volunteers in the early ’60s, members of an alternative service program that allowed Mennonite conscientious objectors to do humanitarian work instead of serving in the military. Mom’s family – Lancaster County strawberry and celery farmers – were especially scared about the newlyweds moving to New York. But Mom and Dad liked The City, and lived there for 13 years, while Dad worked as a schoolteacher and a pastor and Mom raised us and led the neighborhood Bible School. We moved back to PA when my brother, Daryl, was three years old, too young for him to have any solid memories of life in the South Bronx. But now he lives in Brooklyn, and I was coming to New York to visit him and his girlfriend, Deborah, in their new apartment in Fort Greene. 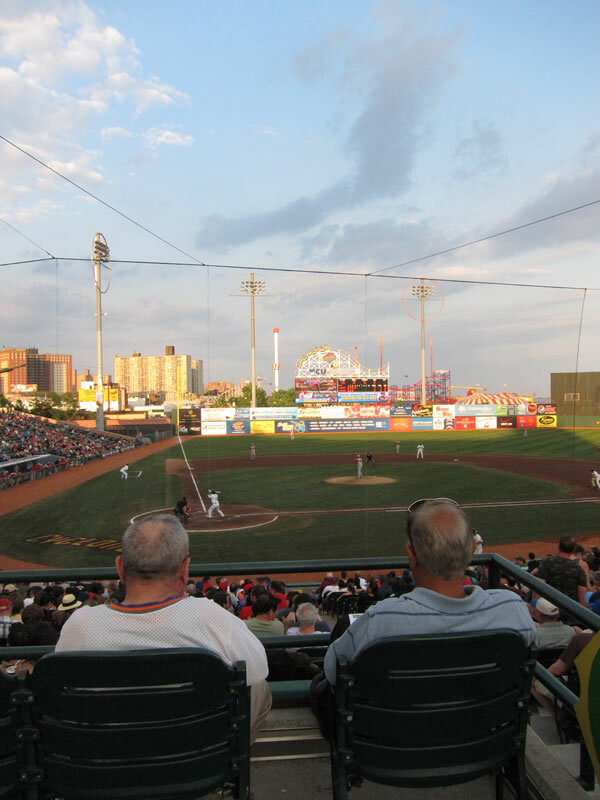 I also hoped to see a Brooklyn Cyclones game, out at Coney Island. I wondered if they would join me. Neither is a sports fan, and they had planned to see a Brazilian percussion concert later the same evening. I listened to Jay-Z on my headphones and watched out the windows as the bus rolled through Harlem down to the Upper East Side, gliding past Central Park before stopping for a traffic light beside the Guggenheim. It was the first time I had ever seen the iconic structure in person, and it seemed smaller than I had imagined. I was also surprised at how clean and graffiti-free Midtown was. Women in black high heels walking designer dogs. Everyone sipping coffee and talking on cell phones. That’s one of my last memories of the South Bronx: weeping in my bunk bed as my mother tried to console me, after some big kids from the neighborhood asked to ride my bike for a minute and rode away, never to be seen again. I got off the bus near Grand Central, and successfully negotiated the subway out to Brooklyn, feeling pleased at my residual city smarts. 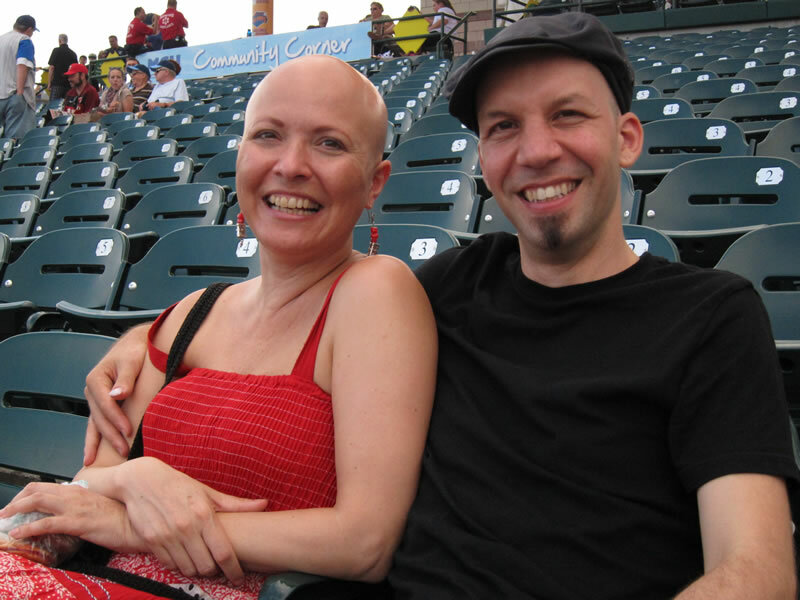 After meeting Daryl and Deborah at the farmers’ market near their house, they filled me in on the plan: we’d go out to Coney Island and see the game together, or at least some of it, before heading off to Park Slope for the concert. Back on the subway, we rocketed through close-packed residential neighborhoods as Daryl, Deborah, and I talked. My brother and I are close, even though for one difficult spell we saw each other only once in a three-year span. I had last seen him only two months earlier, at our father’s wedding, but it still felt like we had a lot to catch up on. I enjoyed the way the light grew softer as we got closer to the sea. I also enjoyed descending the grimy outdoor stairs from the elevated line down to the streets of Brighton Beach. The blue-painted ironwork and the ear-splitting noise of the train leaving the station above us reminded me again of the Bronx, of being five years old, of shopping with my mother. Daryl and Deborah, in addition to being musicians, are serious foodies, and they wanted to sample some delicacies in this Russian enclave, with a focus on fish in all forms: dried, smoked, pickled, raw. So we wondered through a Russian grocery store, as a song competition – Ukrainian Idol? – played on a wavy television above the deli cases. All of the signs were in Cyrillic, and all of the transactions but ours were conducted in Russian. I bought a large, malty beer in a paper bag to drink at a nearby Russian restaurant, and Daryl bought a bottle of kvass, which tasted like raisins mixed with the yeasty homemade root beer Mom brewed in our attic during the sticky Pennsylvania summers. We ate dumplings and pickled herring at the restaurant and then walked along the nearby boardwalk, stopping to listen to a tall young man in white suit singing in Russian while playing an acoustic guitar. The boardwalk reminded me of Barcelona, where my wife and I had visited nearly two years ago. It reminded me of going to the Jersey shore with our church youth group countless times when I was a teenager: sunburn and sand and T-shirt shops and arcades where you could shoot forbidden guns at paper targets. It reminded me of all of the things one is supposed to think of when you say, “Coney Island:” hot dogs and fried clams and pounding music and the sound of the wooden roller coaster, and everywhere, hordes of people escaping the heat of the city. We walked down the pier, to watch the Latin guys fishing and playing congas. The tattoo on the arm of the guy selling sodas out of a cooler for a buck: Perdon, Madre. (Sorry, Mom). A couple in their twenties made out vigorously, leaning trustingly against the wooden railing of the pier, 40 feet above the ocean. What would lead this couple to believe that this was their best chance at privacy, I wondered? Do they each share small apartments crowded with too many family members? Do their parents disapprove? You enter MCU Park, home of the short-season Single A Brooklyn Cyclones, as if you’re going on a ride at the nearby Astroland amusement park. We walked along a smaller boardwalk that spoked out from the main boardwalk, looking for the ticket window, chatting amiably, until we came to a memorial wall, filled with plaques commemorating the Brooklyn firefighters and police officers who died on September 11. “Wow, there are a lot,” Deborah said, and then we turned a corner and there were even more. The ballpark was built in 2001, but it feels heavily-used, like the way the rest areas on the New York State Thruway get shabbier the closer you get to The City. The outfield grass looked patchy, like the field in Binghamton, New York, two steps up the Mets’ minor league ladder. Everywhere else I have visited – including the notoriously sub-standard Centennial Field in Burlington, Vermont – the grass has looked like a suburban dad’s Platonic ideal of a lawn. But not here. The ushers were more vigilant about keeping people to their proper seats than in any other minor league park I’ve visited. And the park was noisy, due to significant bleed-over from the general clamor of Coney Island. Bass-heavy rap music pounded throughout the national anthem. I wondered aloud to Deborah and Daryl: does the music ever stop? Does anyone in this neighborhood wake up early – say, at 5:30 – just to enjoy the relative silence before the bass starts kicking? Anyone who grew up in a dacha outside Moscow, who wants to look at the sea and remember their quiet childhood? “They probably don’t even notice it by now,” Deborah said. This was the least pastoral place I’ve ever seen a ballgame, except for the indoor mistake known as Olympic Park in Montreal. 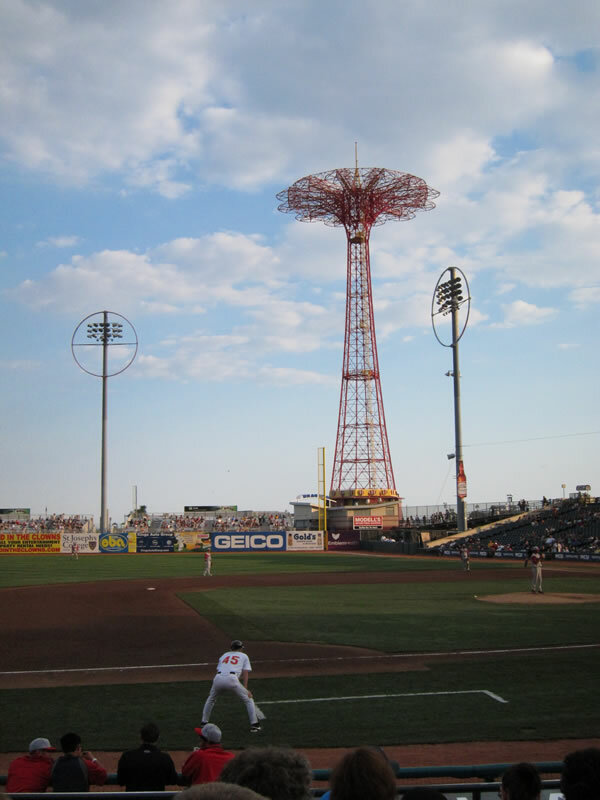 But the Coney Island ballpark does have the ocean out beyond the outfield bleachers, like at the Giants’ stadium in San Francisco. Daryl and I went to a game at that park eight years ago, back when he lived in California and our family got together for a visit. Soon thereafter he moved to Mexico and tried to build a house in Oaxaca with his then-girlfriend. I saw him rarely during those years, but when that relationship ended, he moved back to the States, found a new love, and a new life in New York. It still feels like a blessing, like a surprise, to have the luxury of time with him, to be able to sit and watch a ballgame and wonder about the origins of the metal tower looming between right field and the water. Deborah consulted Wikipedia on her smartphone: the structure is called the Parachute Jump, and it was a ride built for the 1939 World’s Fair. It’s 262 feet tall, she said, and some people are interested in reviving it as an operating amusement. We listened to the screams coming from the modern sling-slot contraption that hurtles people high into the air and back to earth again, all accompanied by the thump of house music, and considered if the Parachute Jump would seem tame in comparison. All of the other minor league games I’ve seen over the past two years have been in third-tier cities or rural backwaters. But although this was New York, I was pleased to see that the crowd was about the same as at my other games – families, Boy Scout troops, solitary male lifers – plus a few components unique to Brooklyn, like the old guys with scorecards who probably followed the Brooklyn Dodgers when they were teenagers, and a spattering of hipsters wearing ironic porkpie hats. Hey hipsters: there’s no irony in baseball. 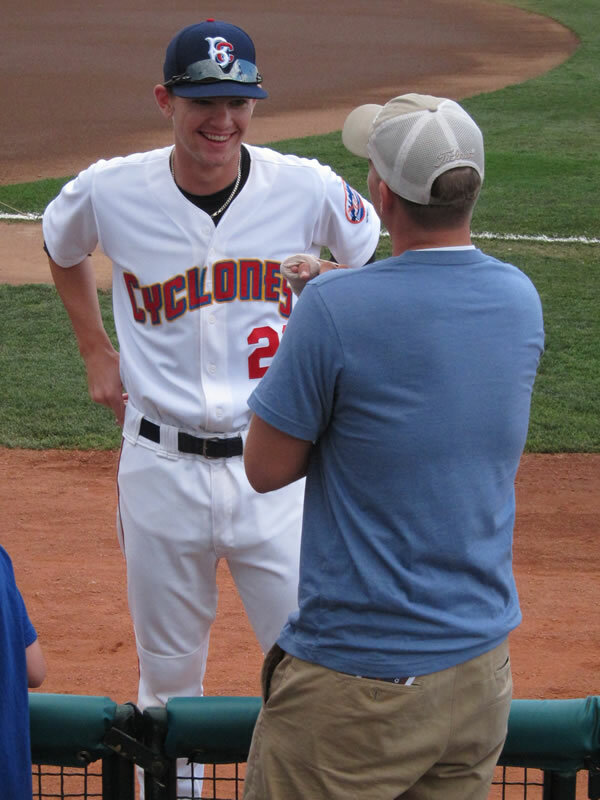 The Cyclones were playing the Lowell Spinners, the Single-A affiliate of the Red Sox. On this night, the teams were evenly matched, and I locked in on the game, noticing how the Lowell batter who was fooled in the first lined a bases-clearing double in the second on the same slider. I tried to describe for Daryl what stood out for me, in the same way he’ll Tweet about the fusion/noise concerts he attends several times a week. I told him how for some of these guys, this is their first taste of life in the States, and how Brooklyn probably suits the Dominicans better than Burlington. How the Lowell pitcher, although he had good stuff, will need to fill out if he’s going to move up the ranks. He doesn’t have a pitcher’s body, I said, even though he was changing speeds and location like a Double-A pitcher. “You do sit really close,” Daryl said. It was hard to pull me away to get to the concert in time. But if the sea was in front of us, the entire metropolis throbbed behind us. After we left in the fourth, the Cyclones came back to win, leaving the hipsters and families and Brooklyn lifers happy. By that time, we were long gone, on the subway, and then to a bar where I drank small-batch rye whiskey, and to the Brazilian percussion show, where I watched Daryl jerk his head in time to the music, giant grin on his face, him tunneling into the music the way I tunneled into the ballgame. After the show, we went to a Central American restaurant, where I ordered in Spanish and drank a Costa Rican beer for the first time in almost 25 years and got nostalgic about the host family I lived with in rural Guanacaste who helped me believe that I was a good person, not a sinner, not someone who needed redemption. We walked through streets still buzzing with people long after midnight, and I didn’t fall asleep in the front room of their apartment until 1:15. I slept through the subwoofers growling from the cars idling at the traffic light outside their second-floor window. In my dreams I heard basketballs rattling against the chain-link fence around PS 90, across the street from our house in the Bronx. On Sunday morning I woke with a feeling of peace, of rightness. Brooklyn is completely foreign to how I live now. I spend much of my summers barefoot, crofting around in our garden, checking on the lambs and chickens and dreaming of buildings I can construct in the woods. Once Daryl woke, we walked to get bagels and bring them back to the apartment for Deborah. Out on the warming streets, again came another memory, perhaps the first thing I can recall, of walking with my father to get the Sunday New York Times when I was three or four. His dark overcoat; my small hand in his large, rough one; my care in not stepping on the cracks of the sidewalk; the heft of the paper as the man at the green newsstand handed it to my father. Before I caught the bus back to Vermont in the afternoon, I bought the paper, and a styrofoam container of so-so Indian food. I read the paper until it grew dark, then listened to the Red Sox game on my headphones. I thought about circles, about the way the hop vines in front of our house gain their green papery cones the same time every year. The way we take our lambs to the slaughterhouse every September, and the way I stack the firewood every October, before the threat of the coming snow. I thought about bagels, and newspapers, and the different circles that have made up my life, and the life of our family, and I was happy for my brother, and no longer afraid.